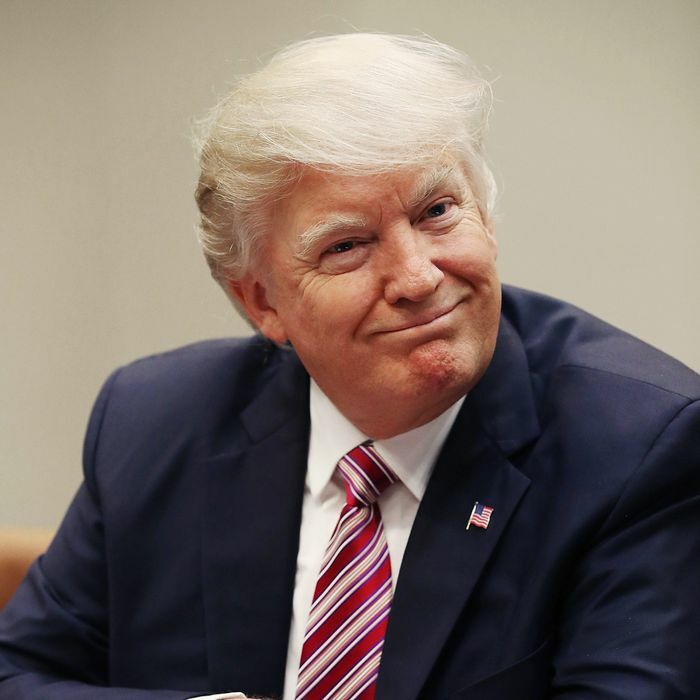 On the first Saturday of this month, President Trump announced that Barack Obama had personally wiretapped his phones during the final month of the 2016 campaign. The president later revealed that this extraordinary allegation was based entirely on publicly available news reports — none of which actually supported the substance of his claim. Despite Trump’s tacit admission that his accusation was baseless, the White House stood by it. And in the course of defending the infallibility of the president’s tweets, the Trump administration sparked a diplomatic spat with the United Kingdom and earned public rebukes from the House and Senate Intelligence Committees, Bill O’Reilly, The Wall Street Journal editorial page, and the FBI. With the health-care fight coming to a climax on Capitol Hill, it seemed possible that the White House would quietly abandon its attempts to validate Trump’s every paranoid intuition. And then Devin Nunes called a press conference Wednesday afternoon. Nunes’s comments were remarkable for many reasons. For one, the congressman accused the Obama administration of improperly handling classified intelligence — by improperly disclosing the details of classified intelligence. For another, Nunes shared his findings with the public before consulting any other members of the Intelligence Committee. Most critically, he proceeded to personally brief the president on his findings, even though Nunes is currently leading the House’s investigation into Russian interference in the 2016 election — interference that the FBI suspects the Trump campaign may have colluded in. Nunes apologized to the House Intelligence Committee for his actions Thursday morning, according to Democratic committee member Jackie Speier. The substance of Nunes’s comments, however, may prove entirely unremarkable. Here’s Nunes’s story in a nutshell: During the transition period, members of Trump’s team contacted foreign agents who were the subjects of routine surveillance by America’s intelligence agencies. Thus, these Trump associates had their communications intercepted. Normally, when American citizens gets swept up in such surveillance, their names are “masked” in intelligence reports — unless revealing their names is necessary to further an investigation. But Nunes says that he has seen reports in which Trump transition officials had their names “unmasked” — even though said reports had no intelligence value. Nunes did not make public the intelligence reports in question, and he attributed his information to an anonymous source. He provided no evidence that the alleged “unmasking” was unnecessary to any and all federal investigations. But if we stipulate that Nunes’s darkest insinuations are true, then intelligence operatives abused their “unmasking” powers to spread sensitive information about the incoming administration throughout the intelligence community. This would be a serious charge, worthy of investigation. It also would not “vindicate” the president’s “wiretap” claims in any way. But don’t tell that to the president or his most trusted news source. Nunes’s information — which he said he would deliver to the White House later — vindicates the bulk of Trump’s claims earlier this month…Though the media, and the political opposition, had attacked Trump for his claims about wiretapping, he later clarified that he had used the term to refer to surveillance in a general sense. He also suggested that more evidence would soon emerge. The result is a vindication of Trump’s controversial claims. 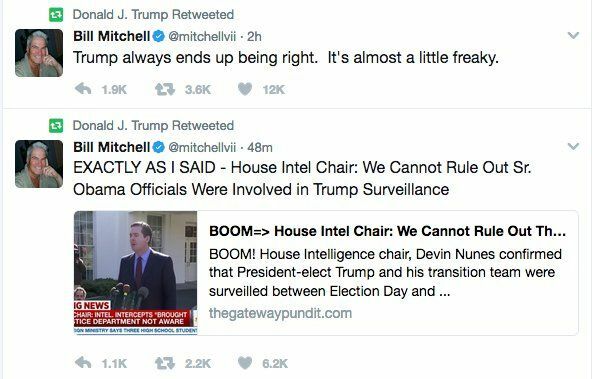 The president of the United States retweeted similar sentiments from conspiracy theorist (and leading election forecaster) Bill Mitchell. Trump further suggested that Nunes had vindicated his tweets, in an interview with Time magazine. This is one of those days when living in Trump’s America feels like being conscripted into a cult. Nunes did not vindicate the “bulk of Trump’s claims.” Trump claimed that Barack Obama, a “bad (or sick) guy,” was “tapping my phones in October.” The words tapping and phones were not written in quotes. The president further claimed that this “tapping” was quite likely illegal, saying “I bet a good lawyer could make a great case” out of it. Nunes’s story is that intelligence operatives may have improperly unmasked the names of Trump officials whose communications were intercepted via routine, legal surveillance — after Election Day. This story does not vindicate the “bulk of Trump’s claims.” It does not vindicate any of Trump’s claims. Which is to say: The president, and his allies, are trying to prove that he isn’t a shameless liar by spreading a shameless lie.